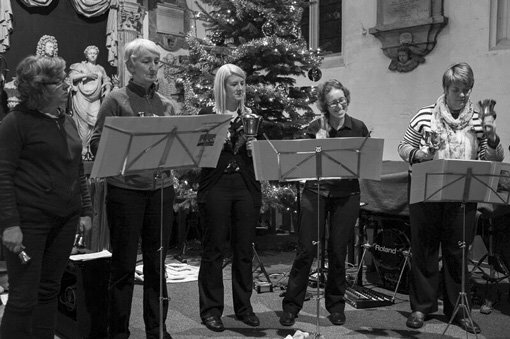 The handbells have been part of the Chapter House Choir’s Carols by Candelight concerts since the first concert by the choir over fifty years ago. The original concerts used Andrew Carter’s four octave set of handbells by Shaws of Bradford. 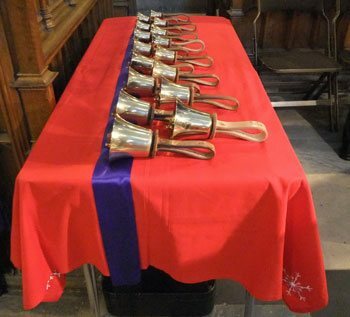 Since then, the Chapter House Choir has been gradually building up a set of fine Whitechapel handbells. Today there are only five bells missing from the three chromatic octaves. 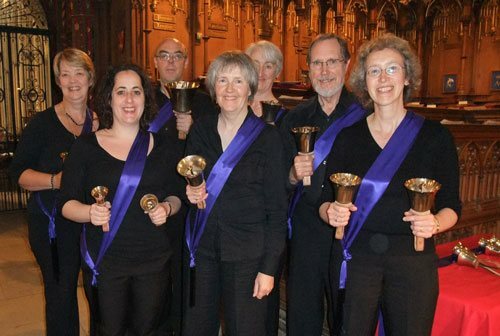 We are most fortunate to have an extensive library of handbell arrangements, all especially composed for the choir and the vibrant acoustic of the Chapter House of York Minster. The carol arrangements reflect the growing numbers of bells, with early arrangements composed for fewer bells. Most of our arrangers have close connections with the choir! Andrew Bunney used to sing in the the Chapter House Choir, and his arrangements date from a time when the choir only had two octaves of handbells. Phil Redding composed many of his arrangements when his wife Denise led the handbell team. John Hastie sang briefly with the choir many years ago, but his handbell arrangements were commissioned in recent years and make full use of all the bells. The choir founder, Andrew Carter, has recently provided several very special arrangements which are fun for ringers and audience alike. The handbell ringers are all singers in the Chapter House Choir. Several members of the team can ring ‘four-in-hand’, where a ringer holds four bells – two in each hand. Rehearsals usually take place after the main choir rehearsals in the run up to the Christmas Carols by Candlelight concerts. Very occasionally, the handbell ringers take part in other concerts or events, such as the Vespers for St Hildegard by Stevie Wishart. This was part of the York Early Music Festival in July 2013 and took place in York Minster.